Knowing how students learn can help educators meet students where they are emotionally and developmentally in presenting material in class. On this page, learn how engaging students emotionally can assist in students being involved learners in your class. When engaged, students can take initiative for their own learning. Educators will find practical applications of research based strategies to teach and motivate students on these pages. 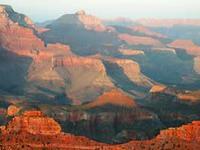 Educators can also find strategies, resources and examples for engaging students in potentially controversial material such as evolution, climate change, and energy issues. Engaging Students: Affective Domain - Strategies and specific teaching approaches can help students engage their emotions in the learning process. Individuals react to what they are learning, coming to value and respect their education. Metacognition - When students become aware of how they best learn they can improve their learning greatly. As teachers, you can help students become aware of how they learn through teaching practices. This resource has example activities, strategies, and information on metacognition. Motivating Unmotivated Students - This resource includes many research based strategies shown to increase student motivation. Strategies include incorporating ideas ranging from using new teaching methods to increasing positive interactions with students. Also included is an extensive list of outside resources to help teachers motivate students. Teaching Controversial Topics - Teaching controversial topics can be difficult for teachers if students hold pre-conceived notions or feel their beliefs are being threatened. Approaching controversial topics with care for students' emotions will help engage them at a deeper level without feeling attacked. Teaching Evolution and the Affective Domain includes practical advice, example activities and resources for teaching evolution in classes. 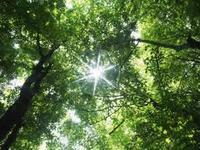 Teaching Environmental Issues provides practical advice and selected literature on how to teach about environmental issues, selected pedagogical approaches and example activities which do a particularly good job or teaching controversial environmental issues in a non-confrontational manner. Climate Communication Synthesis addresses the challenges that educators face when trying to teach about climate change and includes Myth Debunking exercise which outlines the steps an educator can take to de-bunk myths that students present. 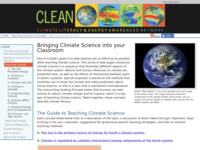 Climate Literacy Pages provide context for why teaching about climate change is so important, what ought to be understood for one to be considered 'climate literate' and links to activities for each climate literacy standard, including many which are appropriate for K-12 classrooms. Energy Literacy Pages provide the context for why teaching about energy is important including what ought to be understood for one to be considered 'literate' in energy concepts. 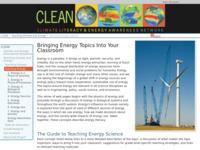 These pages contain links to lessons which can be used to address each energy literacy concept, with many that are appropriate for K-12 educators to use in class. 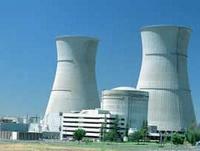 Energy Awareness Quiz provides an interactive way for students to test their knowledge and to explore energy concepts in more depth including looking at data and spreadsheets.